We rented a Trolley from Brewster Coach, they were very courteous, on time and clean. The only complaint was that the door on our trolley got off it's track and was hard to open so we were stuck in the trolley for an extra minute. Not too bad though and I could tell it wasn't because the trolley was damaged or broken. It just happened that day and wasn't a big issue. My wedding party had an amazing time riding the trolley around town! Their business is very well run. 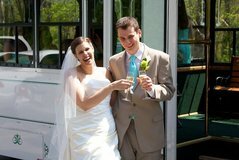 We loved having a trolley to bring the wedding party from the ceremony to the reception. It was really nice to have a large and comfortable vehicle but I'm glad that it could also have some character and charm. We used the trolley again at the end of the night to ferry guests who had been enjoying our open bar a little too much from the reception to the hotels and after-party. The driver was an angel to put up with our horrific singing during that ride!